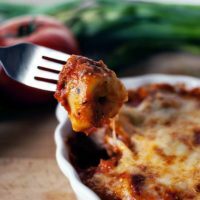 Tortellini bake with rose sauce is quick and easy meatless meal. 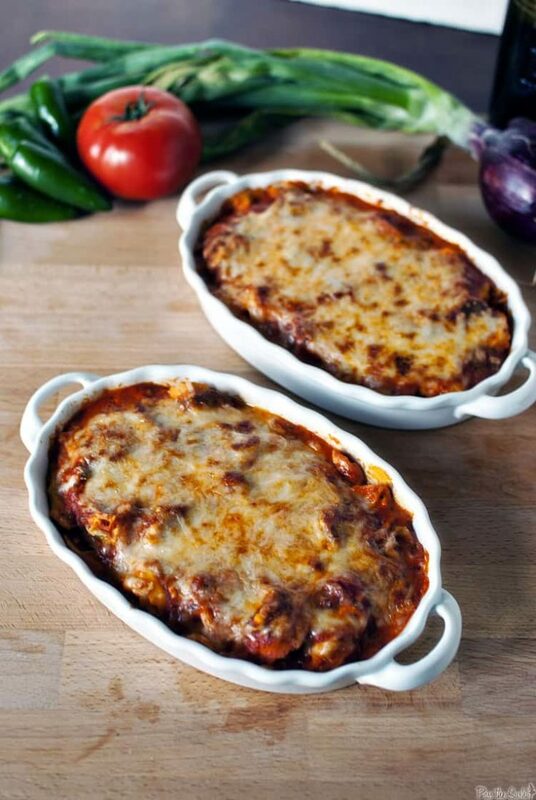 Loaded with lots of cheese and marinara sauce, it’s a comfort food dish that everyone will love. Have you ever been hit on – by a woman? (OK, gents – that what a rhetorical question). Because it happens to me all the time. I was out to dinner with some friends once having an evening of ridiculously fun conversations and being ourselves. I don’t remember what we were really talking about but movies, politics and the sorts tend to be our normal topics. I know Angelina Jolie was being spoken about at once point or another (yeah, I know she’s not everyone’s favorite – but I love her). Our conversation went on and on and when the couple across from us got up to leave the woman headed to our table. She said something along the lines of a pick up regarding how hot our conversation was and how she loved how assertive and confident we were. I winked at my friends thinking one of them was about to get picked up. And then she handed me a business card, “I’d love to hear form you some time.” Followed up by how great my views were and how much she had enjoyed listening to me talk. Um. Not what I had expected at all. And then I looked at the card….. Oh yeah. It was for Slumber Parties, to which my friends had to explain to me was an ‘adult’ themed Tupperware party. Oh my. Don’t let the phrase “rose sauce” fool you. There’s no wine in this recipe. Rose sauce is basically marinara sauce combined with cream, or in this case, cream cheese! Looking for more easy pasta recipes? These are sure winners! If you’ve tried my Quick Tortellini Bake with Rose Sauce recipe or any other recipe on passthesushi.com please don’t forget to rate the recipe and let me know where you found it in the comments below, I love hearing from you! You can also follow along for more good eats and travel tips on Instagram @passthesushi & @girlcarnivore, Twitter & Facebook. Preheat oven to 350 degrees F. Spray one large baking dish or two small ones with cooking spray. Cook the tortellini as per the package. Drain. Meanwhile, stir together the spaghetti sauce, cream cheese, milk, 1/2 cup parmesan cheese, garlic powder, basil, and oregano. Pour the tortellini into prepared baking dish and cover with sauce mixture. Toss a bit to combine. Sprinkle the mixture with the mozzarella cheese and the remaining parmesan cheese. Bake for 20-25 minutes, until the cheese is melted and beginning to brown. This looks so freaking mouthwatering! Yum! LOL!!! Spicy!! And I didn’t mean the pasta bake 😀 That looks super tasty! And that, I meant the pasta bake. I get that alot and still don’t know how to handle it. Gimme a man and I’ll know what to do, no problem. It’s funny that I’m noticing it happening more now that I’m older … strange. Two of my closest friends are a lesbian couple so I get it quite a bit, but in jest from them because they’re married and well, so am I (married, that is). Anyhow, I’m looking to make a baked sausage and penne ragu from a magazine soon but I want to chuck it and make this one instead. Yours looks so much better. Way very much so. That sauce is beautiful! Making dishes like this, I’d hit on you! Love the pasta, it looks so gooey and comforting! Too funny! The dish looks so good, I think it would be a hit for all the kids too! You had me with “quick”! This is totally up my alley. OMG, too funny! Not to mention, um, awkward! I’m totally loving this dish though, it looks quick, easy, and super tasty! Mmmm, this looks so comforting and perfect 🙂 Love that they’re individual sized, too! 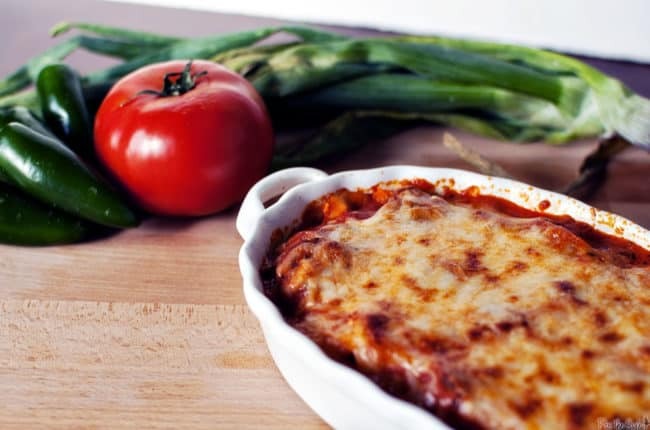 Great comfort recipe! I’m slightly speechless lol. As for the food…I love baked dishes! They just feel so much more special somehow. I have never had something like that happen to me before! But in other news I want this dish for lunch in an hour, mk thanks! The tortellini looks wonderful, and so easy to make. Pasta is something that everybody likes, specially my kids, so I think they will love it. Haha. Funny story. So, you are gonna call right?! This tortellini bake looks really good. We love tortellini in this house so I will give this one a try some time! Oh my is right for your story. I guess you should be flattered? Your dish looks amazing! I would love to have this waiting for me tonight. I love torteliini! It’s one of my favorite foods. 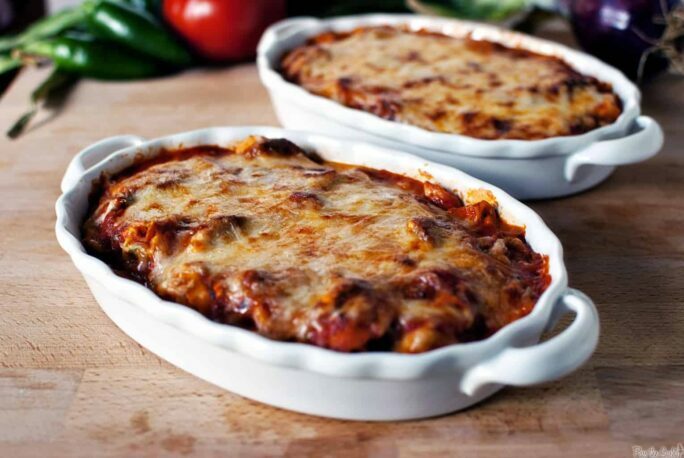 top it with suace and more cheese and bake it… winner! Wow this looks delicious and I love your pictures as well. Definitely going to have to try this recipe! But what is the meaning of 1 24-oz jar? Do u mean 1.24 oz? Hi Shai, I used one 24oz jar of sauce. Sorry for any confusion.